I teach 9th-12th grade computer technology courses at Carson City-Crystal HighSchool. I am starting my 25th year as an educator. My first 14 years were at Laingsburg High School, the last 11 here at Carson City-Crystal. I live in Ithaca with my husband Dave, who is an accountant with Roslund Prestage, Inc., in Alma. We have two children, Erica a junior at Central Michigan University and Jon a sophomore at Ithaca High School. Students will learn the software package Microsoft Office 2007 which consists of word processing, spreadsheet applications, database applications, and power point. 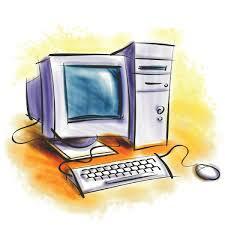 Students will also utilize the internet, and design their own web pages. During the On-Line experience students will explore careers. Software covered in class: database, spreadsheets, integrating programs, data communications, word processing, and publisher. This class presents specialized and professional office simulations. The students learn how to get ready for an employment interview, how to prepare resumes, and how to prepare for college or work after graduation. Video Broadcasting I&II: Students will learn the applications of video broadcasting. During the first semester students will learn how to use the following equipment: a teleprompter, video cameras, title maker, video editing equipment, and sound mixers. Students will learn produce various special video projects. During the second semester students will produce the schools announcements and put on a school news broadcast. Students will learn layout and design applications. They will produce newsletters, business cards, flyers, brochures, tri-folds, tickets, menus, programs, and many other projects. They will learn how to meet deadlines and how important it is for accuracy, like it is in the real world.